*SOLD* View pictures & 3D virtual tour under 'our listings' on this website! 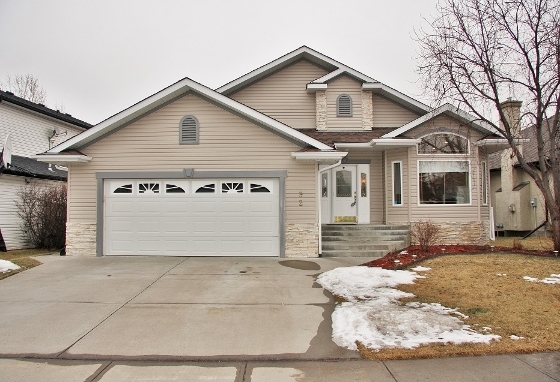 Fabulous Air Conditioned bungalow backing onto the Sheep River Pathways with gorgeous views! This impressive bungalow has vaulted ceilings, gorgeous hardwood, in floor heating, new siding, shingles & a great floorplan. On the main you have a large living/dining room with a gas fireplace, gleaming hardwood & lots of natural light. The large kitchen has dark stained extended height cabinets, central island & corner pantry. The nook area is tiled & overlooks the sunroom. Relax in the summer in the sunroom & enjoy the awesome view! The spacious master has hardwood floor, walk in closet with laundry chute & a 4 piece ensuite with jetted tub. Handy mud room & 1/2 bath also on this level. In the open to below basement is a massive family room with wet bar, gas fireplace with built ins & in floor heat. There are 3 large bedrooms on this level - perfect for a large family, bathroom with dual sinks, den/bed #5 & large laundry/storage. In the landscaped backyard is a Hot Tub & useful dog run. VIEW 3D TOUR!